When Dave Rice became UNLV’s basketball coach in 2011, he looked at how predecessor Lon Kruger built the program with players who would stay for three or four years and passed on those who wanted to play a year and sprint to the NBA. Kruger was successful with that approach, but Rice had been on the UNLV team that won the 1990 national championship, and he wanted to bring in elite players to take the next step and help him return the Rebels to those glory days. But Rice initially went too far the other way, going almost exclusively for top-end talent, players who brought lots of individual skill, but also created a revolving door and all sorts of chemistry issues. So Rice knew two years ago he had to adjust his strategy and recruit a couple of those players a year but make the emphasis on the type of player Kruger used to bring in before leaving for Oklahoma. “Starting with my fourth year, we made the conscious decision that what we wanted to do was create a foundation off high-character players and sprinkle in transfer guys on a need basis,” Rice said. “I think we’ve seen that recruiting Dwayne Morgan, Patrick McCaw and Jordan Cornish and also making sure you get the right guy in Rashad Vaughn. Rashad Vaughn went on to become the No. 17 pick in the (2015) NBA Draft. Rice won’t be able to coach that talent going forward, and he might be stuck forever second-guessing not changing his recruiting approach sooner, which could have kept him on the Rebels’ bench. The search for his replacement is ongoing, and radio analyst and former UNLV great Robert Smith is part of the three-person interview committee that also includes university president Len Jessup and athletic director Tina Kunzer-Murphy. Todd Simon, who became UNLV’s interim coach after Rice was fired Jan. 10, said the next coach must understand the expectations upon taking the job. “I don’t think at UNLV you aspire to win small,” Simon said. “I think this is a program that can win big. And when you have the ability to get future pros and answer questions about whether guys are going to the league, that’s a good thing. Sports Illustrated put together a study to determine which coaches who were at the same school at least the past four years were best at recruiting players for instant and long-term impact. The study was limited to the nine top conferences, including the Mountain West, as well as top programs in the Missouri Valley and West Coast conferences. Rice scored second in the study in instant impact with newcomers adding an average of 4.7 points per 100 possessions. Kentucky’s John Calipari was No. 1 with a 9.1 average. But Rice had the study’s worst development and deployment rating (minus-4.8) and was third from last in retention rating (minus-5.2). The development and deployment rating is based on players outperforming their recruiting rankings and prior statistics on a yearly basis, and the retention rating is the ability to keep players in the program longer than first projected while avoiding picking up transfers. Those statistics underscored why the Rebels have struggled to find cohesiveness and develop a consistent program like what Kruger ran when he won more than 20 games five consecutive seasons and went to the postseason each year, including four trips to the NCAA Tournament. UNLV won at least 20 games in Rice’s first three seasons and made the NCAAs his first two years. But the Rebels ended each of the past two seasons 18-15, and haven’t played in the postseason since appearing in the 2013 NCAA Tournament. 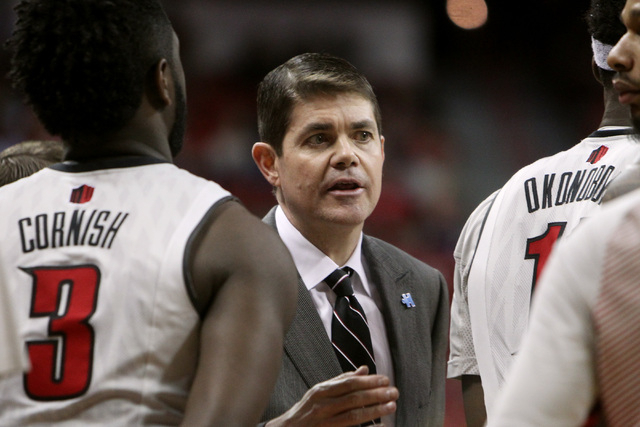 Rice recognized a modification in approach was needed, and that occurred two years when UNLV signed Cornish, McCaw, Morgan and Goodluck Okonoboh to form its core. And what precipitated the change? As for the players who formed the bulk of that recruiting class, three are still on the team. McCaw was UNLV’s best player this season, Cornish has shown flashes of being an excellent shooter but has struggled with inconsistency, and Morgan hasn’t lived up to expectations. Okonoboh left the team in November. But that class still could provide much-needed stability, especially if McCaw returns for his junior season. Cornish could build on his early success, and Morgan might still develop into the type of player who was ranked by Rivals.com as the nation’s No. 15 player in the 2014 class. UNLV has three players for this year’s class who could be key pieces for the next coach to build a program if they stay committed to the Rebels. A Rebels team that next season will face Kansas at home and Oregon in Portland, visit Arizona State and probably play Duke at T-Mobile Arena.